Rudhrama Devi trailer in August? 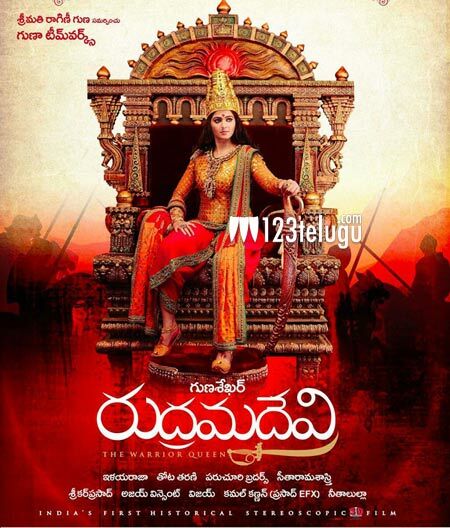 Anushka will be seen as Queen Rudhrama Devi of the Kakatiya Dynasty in the upcoming film ‘Rudhrama Devi’. The movie was in the news recently for the jewellery theft that took place on the sets. This matter is now being investigated. On the other hand, the film’s first trailer might come out in the month of August. Gunasekhar feels that it is high time to give a glimpse of what he has done so far with the film and this trailer will show that. Rudhrama Devi is being made in 3D with very high budgets and it is going to have a huge star cast. Allu Arjun is playing a special role and Rana Daggubati will be seen as a prince. Rudhrama Devi is being produced and directed by Gunasekhar.